OncoRad, Paris · 2018, Darmon A. et al. Darmon A., Zhang P., Paris S.
Recent results of a phase II/III in locally advanced Soft Tissue Sarcoma patients demonstrated clinical benefits of intratumorally injected HfO2-NP activated by radiotherapy compared to radiotherapy alone, validating their first-in-class mode of action. In addition, animal studies have reported that HfO2-NP+RT can induce an abscopal effect, where RT alone cannot. Here, using a mouse abscopal assay, we measured T cells infiltrates in treated and untreated tumors after HfO2-NP intratumor injection and activation with RT, and their role in the abscopal effect. These data indicate that the immunogenic conversion of the tumor microenvironment triggered by HfO2-NP+RT generates the abscopal effect by activation of CD8+ T cells. HfO2-NP+RT may potentiate a pro-inflammatory microenvironment appropriate for enabling an anti-tumor immune response. 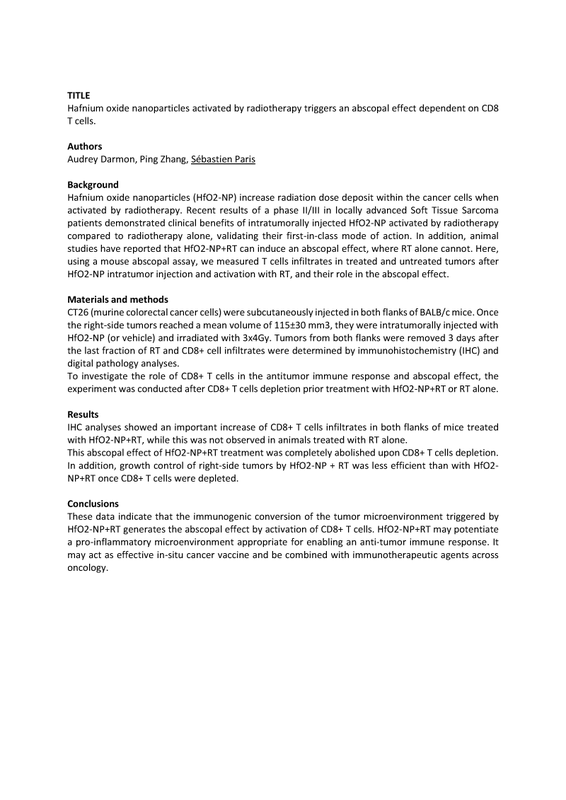 It may act as effective in-situ cancer vaccine and be combined with immunotherapeutic agents across oncology.